We bought a new house in Fountain Hills, AZ. With the hot weather in the summer it just seemed to make sense. Being the science guy I really wanted to understand why all this pool chemistry stuff seemed so complicated. I'm a DIY guy and a scientist, so how hard can this stuff really be. My friend Bill He's had pools in Arizona for many year, but not sure how to franchise his knowledge, so most of you can skip this one. 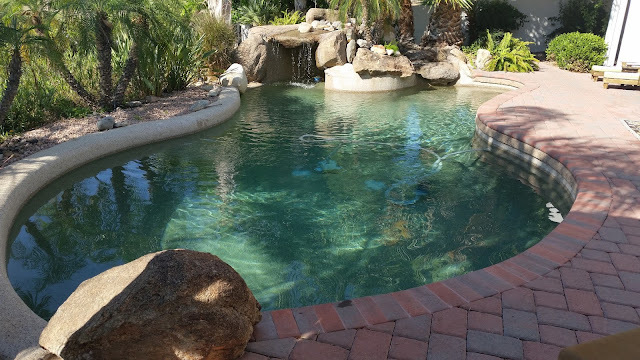 Trouble Free Pools websitehttp://www.troublefreepool.com - great website with real information on pool chemistry and how simple it really is. I now effectively maintain my pool myself with Walmart bleach (sidum hypochlorite and water), Muratic acid. When filling the pool I added Cyanuric acid as a Chlorine stabilizer and Borax as a buffer/mild anti algaecide.